In a tweet on November 8 the US Embassy in Syria highlighted a new video about northern Syria. 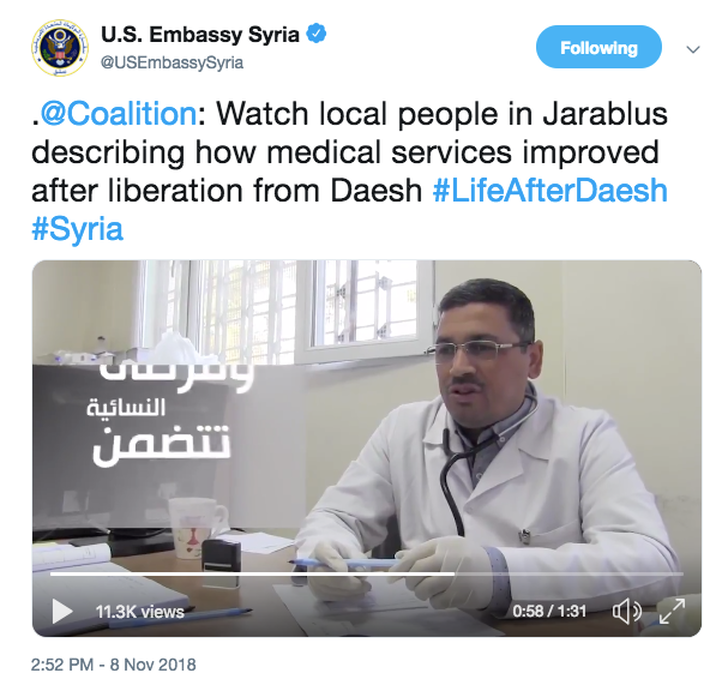 “Watch local people in Jarablus describing how medical services improved after liberation from Daesh,” the tweet noted. It used the “#LifeAfterDaesh” hashtag, which has been used to highlight life returning to Mosul, Ramadi, Raqqa and other cities. The tweet comes from the embassy but also mentioned the US-led Coalition (@Coalition) which refers to the “Global Coalition committed to degrading & defeating Daesh.” The mention of Jarabulus, which has been controlled by Turkey and Turkish-backed Syrian rebels since August 2016, is a new move for the US and may represent a shift in policy. Although one tweet may be innocuous, the fact that it is the only tweet of its kind by the US Embassy in Syria, highlighting Jarabulus which is within the Turkish Euphrates Shield area, shows that the US is focusing on the area of Syria controlled by Turkey and Syrian rebel factions Ankara supports. It is also one of 11,000 tweets by the embassy, but it is only in English, whereas many other tweets are in Arabic, such as the one below it which refers to Raqqa. This appears to be a certain kind of messaging. Because the tweet comes at a unique time in Turkish-US relations, amid tensions over eastern Syria, the tweet may represent renewed US focus on northern Syria and signal approval for the Turkish and Syrian rebel role there. This would not be out of place for Washington’s historic policy in Syria, which has opposed Syrian regime leader Bashar al-Assad and has partnered with Syrian rebel groups, but it would reflect a new focus on that front. The tweet comes amid changes in the relationship between the US and Turkey. It takes place almost a month after US pastor Andrew Brunson was released by Turkey on October 12. The pastor’s detention for two years had harmed relations between Washington and Ankara and gained the attention of US President Donald Trump. So why highlight Jarabulus now, and what does Jarabulus symbolize? Turkey intervened in Jarabulus, a strategic town on the Euphrates, to liberate it from ISIS, but the move came amid concerns in Turkey that the SDF and YPG would advance beyond Manbij. The operation not only stopped the Coalition and mostly Kurdish forces from moving beyond Manbij toward Afrin, but also brought Turkey increasingly into the war in Syria. Taking over 2,000 sq. 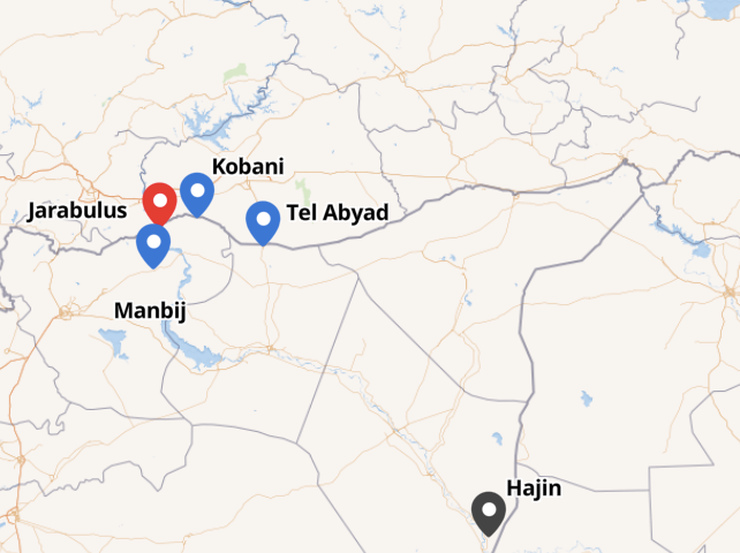 km between Jarabulus and the northern Aleppo countryside became a blueprint for subsequent Turkish intervention in part of Idlib in 2017 and then in Afrin in January 2018. Eventually Turkey and its Syrian rebel allies would move into 4,000 sq km of areas in northern Syria. In September Turkey signed an Idlib agreement with Russia, cementing its role in northern Syria. It now controls a swath of territory. Tens of thousands of Syrian refugees returned and Turkey sought to highlight its role in 2017, with reports in regional media that showed services and peace had returned to these areas. Jarabulus now has deep Turkish ties. 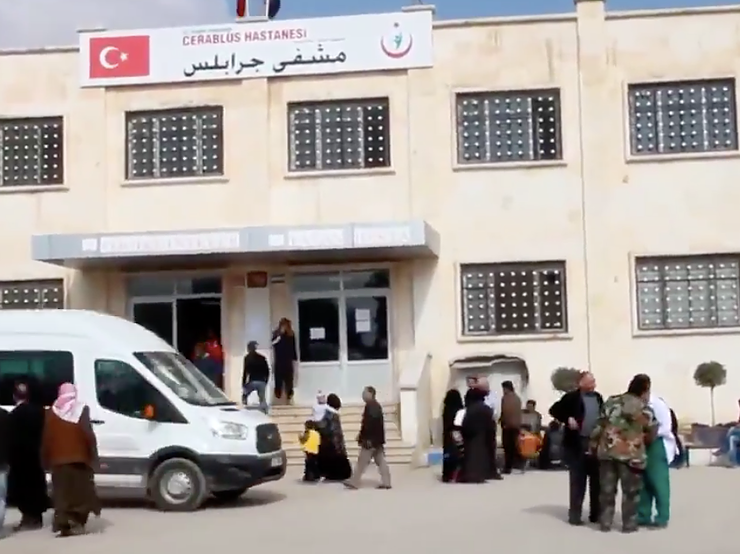 A report in 2017 noted: “Signs of Turkish influence are everywhere in the Syrian town of Jarablus. Doctors wear gowns bearing the name of the Turkish health ministry. Grocery stores are piled high with boxes of Turkish biscuits. There is even a distinctive yellow branch of the Turkish postal service.” Hospitals, schools, electricity, college degrees, all became symbols of Turkey’s role and Turkish media has played this up. TRT reported on Jarabulus the day before the US Embassy in Syria tweeted about it. “The Syrian border town of Jarabulus has changed since it was liberated from Daesh two years ago and thousands are heading back. Around 250,000 Syrians have already returned to Turkish-controlled areas of Syria, according to Turkey’s Disaster and Emergency Management Authority (AFAD),” the TRT report noted on November 7. Showcasing Jarabulus also comes amid the tensions between Turkey and the YPG in northern Syria. In late October Turkey shelled areas along the border in northern Syria, near Kobani and Tel Abyad. Turkish media began to have stories claiming that Syrian refugees from Tel Abyad demanded Turkey intervene. “Syrian refugees in southeastern Turkey say they want Turkish forces to clear their hometown of YPG/PKK terrorists,” reported pro-government Yeni Safak on November 1. “Turkey-backed Free Syrian Army (FSA) ramped up its military buildup near Tal Rifaat and Manbij against a possible offensive by the PKK terrorist group’s Syrian affiliate People’s Protection Units (YPG). The group is reportedly preparing for attacks on FSA-held areas following Turkey’s shelling of positions held by the terrorist group and Turkey’s possible full-fledged operation in northeastern Syria,” noted Daily Sabah on October 31. 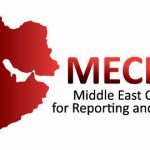 These reports indicated a possible Turkish “military campaign” against the YPG in eastern Syria. It’s not the first time that the US-led Coalition and Turkey appeared to be on a collision course in eastern Syria. But it comes at a time when Ankara thinks the US might be leveraged to “break” with the YPG. The PKK rewards were seen as part of that, along with the joint military controls. The SDF, which had been fighting a difficult campaign against ISIS with the Coalition in southern Syria near Hajin, suspended operations on October 31 when Turkish shelling began near Kobani. This put the US in a position of ostensibly having to choose what to do. It can’t have one NATO partner shelling its key anti-ISIS partner. Ostensibly the message of the Jarabulus tweet is to show how medical care has increased since the town was liberated in 2016. A Turkish flag symbol is on the hospital, a clear sign of Turkey’s key role. The men and one woman who are interviewed in the video contrast the services today with 2016. They say that they want to open a new hospital initiative nearby. The video lasts 1:31 minutes and it is not entirely clear who made it. It has Arabic subtitles on one side and English subtitles have also been added. It doesn’t say who is paying for the medical care, or name the people being interviewed. As such it is difficult to determine who made it or how the embassy decided to tweet it. Other videos put out by US-Coalition supported groups have the logo of the group on them. Is there an actual US connection to the medical care, or is it just to highlight what is happening. The statement mentioned Jarabulus but didn’t elaborate on it. Clearly the city has not been one the US has focused on, either in anti-ISIS contexts or other reasons. Yet suddenly on November 8 the US Embassy in Syria, for its first its third time ever, tweeted about the city. The other two times were in August 2016 and March 2017. In August 2016 Brett McGurk, the anti-ISIS envoy, noted that removing ISIS from Jarabulus “eliminates a primary border hub for transit of fighters & operatives for terrorist attacks.” The March tweet coincided with the press release in March 2017 mentioned above. The tweet on November 8 clearly seems to coincide with the joint patrols near Manbij and other aspects of US-Turkey engagement, even though it doesn’t mention Turkey directly. It provides a stamp of approval for Turkey’s role in Jarabulus and indicates that Turkey can be a potential partner, along with the Syrian rebels, to stabilize parts of Syria. This comes after almost two years where the US has been reducing its support for Syrian rebel groups, at the same time Turkey has been increasing its work with Turkish-backed groups in northern Syria. Is there divergence between the US State Department and Defense Department regarding the US role in eastern Syria and Turkey’s role in the north. It comes as the US Defense Department has been discussing the mission in eastern Syria and calls by some Washington officials to “leverage” eastern Syria to remove Iran from the rest of Syria. The Defense Department see the “U.S. goal of improving bilateral relations with Turkey, while also continuing to work with the YPG,” according to a recent Inspector General report. The anti-ISIS campaign views the Syrian civil war as a complicating factor, even as the US has pivoted to more stabilization work in eastern Syria. This includes a USAID funded 3-year, $45 million program called Syria Essential Services II “that is designed to stabilize conflict-affected communities by restoring and expanding essential services, and increasing employment opportunities.” Whether these efforts in “liberated areas” will one day apply to Jarabulus is unclear, but the video may also point to a potential expansion in that direction.